Technicolor Kitchen - English version: Sour cream dulce de leche swirl cake + "Midnight Cowboy"
Sour cream dulce de leche swirl cake + "Midnight Cowboy"
I watched many wonderful movies when I was younger – that was when I started paying attention to the directors, and not only to the cast – and many of the movies I saw back then have become classics; however, there are still many to be watched, and a couple of days ago I gladly crossed another name off my list – the fantastic and brilliant “Midnight Cowboy”. Up to this moment I’m amazed by Jon Voight’s and Dustin Hoffman’s performances – there are no words to describe what these two do in this movie, it is fine acting at its best, the kind I’d love to see more often in the movies released nowadays. I adore opening sequences – my friend Bianca knows that – and “Midnight Cowboy” has one of the best I’ve seen: it’s beautiful, kind of poetic, and “Everybody’s Talkin’” gets stuck on your head indefinitely. And aside all the greatness of this movie, one thing really stood out to me: how much Angelina Jolie looks like her father when he was younger – the resemblance is really impressive. Preheat oven to 180°C/350°F. Butter a round 20cm (8in) springform pan, line base with a circle of baking paper and butter the paper as well (I used a pan with a removable bottom). In a medium bowl, whisk together the flour, baking powder and salt. Using an electric mixer, cream butter, sugar and vanilla until pale and creamy. Add the eggs, one at a time, beating well after each addition. Beat in sour cream. Fold in flour mixture. Spread half the butter mixture into the pan. Top the butter mixture with spoonfuls of dulce de leche. Use a knife to create a swirled effect. Repeat with remaining butter mixture and dulce de leche. Top with the pecans. Bake for about 1 hour or until golden and a skewer inserted into centre comes out clean. Cool in the pan over a wire rack for 25 minutes, then carefully remove the sides of the pan. Cool completely. Beautiful cake, I love the swirl! That cake has my mouth watering. It looks so amazing with all those pecans on top! Anonymous, that is great news! Thank YOU for letting me know how the cake turned out! I've made this cake several times, most recently last week when two of my girlfriends came over for dinner while my husband was away visiting his mother. This cake is insanely delicious in the opinion of everyone I've made it for. Dulce de leche really should be a controlled substance. It is so tempting that one of my dogs kept trying to climb on the table and steal it even though there were three people right there. I had to move it to a high shelf. The first time I made it I used cajeta, because I had some and I didn't have any dulce de leche. I loved it with cajeta, but everyone else found it too strong. Thanks so much for giving us so many wonderful recipes. You're the best. 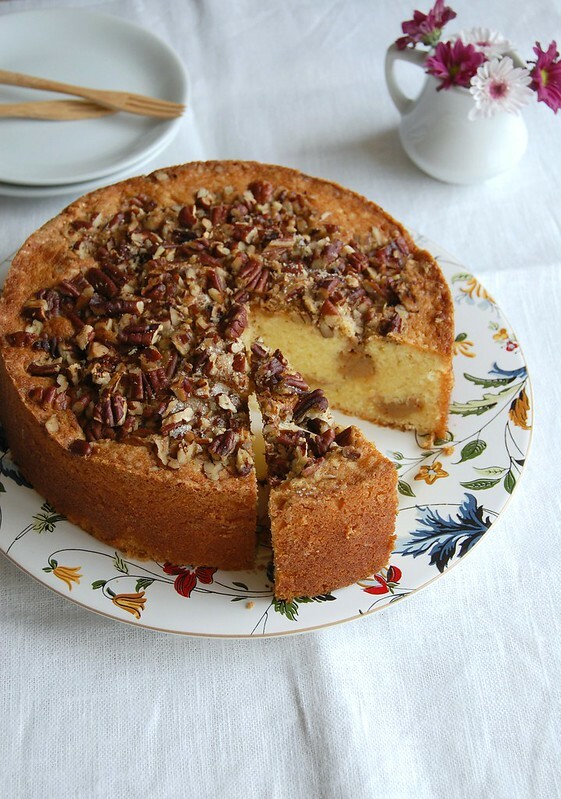 Ellen, my darling, this is one of my favorite cakes, I am a complete sucker for dulce de leche (like most Brazilians), so I am very pleased to hear you like it too! I have never tried cajeta, I love goat's cheese, maybe I will enjoy cajeta as well.